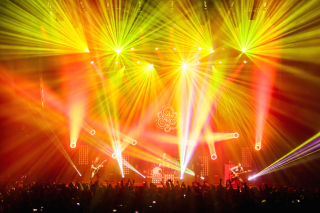 Coheed and Cambria, the American progressive rock band whose concept albums tell the sci-fi story of The Amory Wars, has wrapped a concert tour that included a complement of Clay Paky A.leda B-EYE K20s and Sharpys. Coheed and Cambria recently toured with the band Thank You Scientist, playing 25 dates across the US and in Toronto. Coheed and Cambria’s setlist followed “In Keeping Secrets of Silent Earth: 3,” their 11-year old second album, which has recently been remastered and rereleased. Clearwing Productions supplied the lighting package for the tour, which included Clay Paky fixtures. “When placing fixtures on the floor, their footprint also becomes a factor,” he adds. The Sharpys’ compact footprint supported the notion that, “Bang for your buck is less important than bang per square foot,” he says. “From a design perspective, the Keywork was purely a visual piece, the Sharpys were purely a lighting effect, and the B-EYEs had the ability to be either and merge everything so that each look [became] one cohesive idea,” Hionis explains.